Pakistan National Electric Power Regulatory Authority (NEPRA) has cut electricity price by 2.99 rupees (2.7 U.S. cents) per unit under the fuel adjustment for the month of December, 2017, according to news reports. This reduction brings the price per kilowatt-hour to Rs. 5.11 (4.60 US cents), down from Rs. 8.10 (7.30 US cents). Reduction brings the price per kilowatt-hour to Rs. 5.11 (4.60 US cents), down from Rs. 8.10 (7.30 US cents). The CPPA (Central Power Purchasing Authority) said total energy was generated at the cost of Rs. 25.24 billion, or Rs. 3.52/unit for the month of November, 2017. The reduction in the actual generation cost is mainly because of a decline in fuel prices, zero use of high-speed diesel in the power plants and higher contribution from the cheapest source – hydropower. The furnace oil (Rs. 9.03 per unit) has been replaced by domestic natural gas at Rs. 4.49 per unit and liquified natural gas (LNG) at Rs. 6.33 per unit. This decision will not affect K-Electric consumers which is privately owned and generates its own power for residents of Karachi. K-Electric currently charges significantly higher rates of Rs. 12.77 per unit (11.50 US cents per unit). Across the border in India, the nation's Central Electricity Regulatory Commission (CERC) has set the national average power purchase cost (APPC) at INR 3.48 (5.43 cents), barring a few states for open access. The APPC will apply during the financial year (FY) 2017-18 and until further orders for deviation settlement with respect to open access, according to Indian media reports. The latest round of power rate cuts in Pakistan has brought the average electricity unit price (4.60 US cents) lower than that in neighboring India (5.43 US cents). The average cost per unit of power produced by new power plants being built in Pakistan as part of CPEC will likely be higher. It's mainly due to higher depreciation cost of new plant and equipment and higher guaranteed return on equity (ROE) of 17% for Chinese IPPs (Independent Power Producers). The 17% return on equity in Pakistan is higher than 4% to 15% ROE for power companies in India. The average return on equity for almost 8,000 large US firms is 14.49%. The power utility companies – with an average of 10.13% – are on the lower end of the spectrum because they are viewed as less risky investments. In the United States, the rate of return varies significantly from state to state, as each state regulator has exclusive authority to regulate utility operations as they choose. In Advance Energy Economy (AEE) Power Portal database, which tracks ROE for over 100 investor-owned utilities across the country, the highest allowed ROE belongs to Alabama Power Co., at 13.75% and the lowest to United Illuminating Co. (CT) at 9.15%. Within the US states, Alabama being seen as relatively less safe for investment, offers 13.75% return. So why is it such a surprise to see Pakistani regulator offer Chinese investors a higher rate of return of 17%? 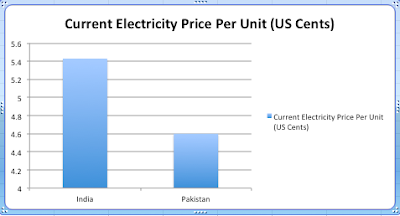 The current per unit average cost of electricity to consumers in Pakistan is 4.60 US cents while the average in India is 5.43 US cents. Per unit cost of electricity in Pakistan is likely to be bit higher with new capacity being built as part of China Pakistan Economic Corridor due to higher guaranteed rates of return offered to attract Chinese investors. However, plentiful supply of electricity from CPEC power projects will significantly boost economic growth and create millions of new jobs. CPEC Financing: Is Pakistan Being Ripped Off? Will Pakistan Benefit From Historic Low LNG Prices? Hafeez: What if the consumption is 346 units? Think about the problems of a common man; you are earning Rs.15000/-a month and your electric bill is Rs.7000/-a month. Do you think is it encouraging? Riaz: I thought, on a Help yourself basis (kunda), it was $0.00! Completed at a cost of Rs404.321 billion, revenues from the supply of 5.5 billion units of electricity annually at a cost of approximately Rs7 per unit will be spent on the repayment of loans acquired to meet the cost of the project. The project official said the project would be run by Neelum-Jhelum Hydropower Company with AJK chief secretary being one of the members of its board of directors. An agreement between the AJK government and Wapda had yet to be inked as it was under consideration of the ministry, Allauddin said. Allauddin, who is also the project director, said clauses of the agreement had been approved by the AJK government and Neelum-Jhelum Hydropower Company was working within the framework of the draft agreement as far as construction and implementation were concerned. KARACHI: Although power production increased in Pakistan in December 2017 after the addition of several new coal, nuclear and wind power projects in recent months, but output of the cheapest source – hydel – dropped significantly. Power production by hydroelectric power projects fell 25% to 1,231.53 gigawatt-hour (GWh) in December 2017 compared to 1,642.65 GWh in the corresponding month of previous year, according to the National Electric Power Regulatory Authority (Nepra). The drop in production came despite better water management in dams and rivers this winter and the decline may be linked with prolonged overhaul of the projects as compared to the plan. Overall production, however, improved 8% to 7,762.84 GWh in December 2017 from 7,199.66 GWh in December 2016. The increase in production came after several new gas, coal, nuclear and wind power projects started churning out energy. Pakistan saw a fresh addition of over 5,000 megawatts in calendar year 2017. Over 80% of that was achieved with the help of imported liquefied natural gas (LNG) injection into the system. In December, there was also a massive surge in power production from imported coal-fired projects in Punjab. Power production from this source soared 360 times to 909.59 GWh from a negligible 2.53 GWh in December 2016, showed the data released by Nepra. The sharp increase in the share of coal-based power production (12% in total energy mix compared to 0.04% a year earlier) offset a massive drop in hydroelectric and oil-fired electricity output. Production by furnace oil-fired projects fell 16% to 2,251.45 GWh from 2,673.30 GWh. Diesel-fuelled power generation slipped to 51.47 GWh from 60.62 GWh in December 2016. The oil-based power production dropped after the government abruptly closed most of these plants with the start of LNG and coal-fired projects in October and November 2017. It, however, allowed limited resumption of work at the oil-based power plants in December in a bid to address an emerging glut in the oil supply chain. Local and imported gas-based power production remained stable in December despite the diversion of gas for domestic consumption in peak winter months. The situation is expected to improve by next winter as public gas utilities – Sui Southern Gas Company and Sui Northern Gas Pipelines – are actively working on laying two additional pipelines from Karachi to Punjab. These pipelines will transmit LNG from Karachi’s seaports to Punjab where authorities have launched LNG-based power projects of around 3,600 megawatts. Production from nuclear and renewable energy sources like wind and solar also went up in December 2017. Power distribution companies have, in a petition filed to Nepra, sought a downward revision of Rs2.77 per unit in the tariff for December 2017. The proposed reduction, which will take the tariff to Rs5.33 per unit, will not be applicable to the consumers of K-Electric, which is a privatised company that separately seeks the tariff revision. To take a decision on the petition, Nepra has scheduled a public hearing for January 25 in Islamabad. ISLAMABAD: The government has decided to ink direct liquefied natural gas (LNG) supply deals with more energy-rich countries in the hope of securing cheaper contracts compared to spot purchases from energy companies. The decision came after Pakistan received higher bids for spot purchases, which led to cancellation of a couple of contracts. At present, Pakistan has a 15-year government-to-government LNG import agreement with Qatar, which has been shipping gas since March 2015. Now, the government has got engaged in talks with other countries as well including Russia and Malaysia to clinch state-to-state supply deals. “State-owned Pakistan LNG Limited has been forced to scrap deals for two LNG ships due to higher quoted rates. Bids were invited for four cargoes and in response foreign companies made offers in the range of 13.2% to 16% of Brent crude oil price,” said a senior government official while talking to The Express Tribune. Qatar is supplying LNG to Pakistan at 13.37% of Brent price and global commodity trading firm Gunvor is also bringing cargoes at the same rate. Apart from these, Pakistan LNG Limited sought bids for short- and long-term purchases and secured contracts at the best rate of 11.64% of Brent crude price. Short-term deal was signed with Gunvor whereas the long-term contract was won by Italian energy giant Eni. The two companies will supply 200 million cubic feet of gas per day (mmcfd), meaning Pakistan LNG Limited needs to secure contracts for an additional 400 mmcfd, which will be supplied to three LNG-based power projects of 3,600-megawatt production capacity in Punjab. Already, the second LNG terminal has started commercial operations in late November 2017 at Port Qasim in order to dedicate 600 mmcfd of LNG for the three power plants. According to the government official, Pakistan LNG Limited planned to make spot purchases for the additional 400 mmcfd through six ships – two ships by Eni and Gunvor and the remaining four through spot purchases. Consequently, the company invited bids, but the offers were made at higher rates compared to those for the existing deals. Vitol submitted bids at 15.9147% of Brent price for March 8-9 delivery and 13.8301% for delivery on March 22-23. Trafigura offered its bid at 15.0591% of Brent price for March 27-28 delivery and BB Energy came up with the lowest bid at 13.2701%. Earlier, these companies technically qualified for the supply of four cargoes in February 2018 at higher rates. BB Energy submitted its bid for February 6-7 delivery at 15.731% of Brent price and Gunvor offered to bring cargo on February 16-17 at 16.0857%. For February 21-22 delivery, Trafigura submitted its bid at 15.8488% whereas for February 26-27 delivery, the company quoted 14.9887% of Brent price. PAKISTAN’s enormous mineral wealth has long lain untapped. Since a 1992 geological survey spotted one of the world’s largest coal reserves in Thar, a scrubby desert in the southern province of Sindh, prospectors have hardly dug up a lump. Among those to flounder is a national hero. Samar Mubarakmand, feted for his role in Pakistan’s nuclear-weapons programme, has just shut the coal-gasification company he founded in 2010, when he vowed on live television to crack Thar. To such qualms, the government offers three rejoinders. First, severe power shortages have long blighted the nation, and renewable sources cannot offer the daylong, year-round power it needs. Second, coal accounts for less than 1% of current generation, compared with 70% in neighbouring India and China. And third, domestic coal would allow the country to forgo expensive imports of the fuel for newly built power stations, a drain on fast-dwindling foreign-exchange reserves. Eight years ago Engro bought the rights to one of Thar’s 13 blocks, containing 1% of the reserve (more than enough given the gargantuan size of the mine). To work on extraction, it formed the country’s biggest ever public-private partnership, the Sindh Engro Coal Mining Company (SECMC), in which Engro digs and the state provides infrastructure. Relying on the state can break strong firms. Engro itself almost went bankrupt in 2012 after the government refused to honour a sovereign guarantee to provide gas to one of its fertiliser plants. Yet without similar government support, no other Thar block-owners have secured financing, leaving Engro’s diggers, which began work last year, to move ahead. The endeavour benefits from being in the group of infrastructure projects that make up the $62bn China Pakistan Economic Corridor, a hoped-for trade route. Western banks shook their heads when approached about a coal project, so Engro has relied on Chinese financing. Analysts note an irony in China’s promotion of coal abroad as it withdraws from the fuel at home. Handling the extraction at Thar is the China Machinery Engineering Corporation, a state-owned firm with expertise beyond Pakistan’s reach. Around 126 metres below the sands of Thar, with just 20 more to go, Engro’s diggers can now almost touch their prize. When the coal is reached, as is expected in mid-2018, it will feed a pit-mouth power station constructed by Engro, and, in time, three others owned by partners in the SECMC. These stations will furnish around a fifth of the country’s electricity for the next 50 years. The financial rewards could be vast. “All my richest friends are jumping up and down [because they did not get there first]”, says the boss of one big multinational construction business. Hurdles remain, not least complaints from nearby villagers about the disposal of the vast quantities of wastewater from the mine on their ancestral grazing lands in the form of a reservoir. In reply, Engro stresses its social work in the surrounding district of Tharparkar, the poorest in Sindh, which includes the construction of several free schools. More self-interestedly, it is training locals to drive so they can man the dump trucks that trundle day and night around the mine. According to Shamsuddin Shaikh, chief executive of Engro Powergen, the conglomerate’s energy division, Engro also has its sights on Reko Diq, a gargantuan and long-stalled copper mine in Balochistan, the least developed of Pakistan’s provinces. To tap one of the country’s two largest and most niggardly mines is hard enough. Imagine cracking them both. As a consequence, the LNG throughput handled by PLL from Gasport Terminal would be reduced from 300 million cubic feet per day (mmcfd) to 200mmcfd while PSO would reduce supply from Engro Elengy Terminal from 600mmcfd to 500mmcfd. All the three LNG projects were required to achieve commercial operation date (COD) on combined cycle by December 2017 under revised schedule instead of original schedule of June-August 2017, but are yet to reach that stage, he said. One of the plants may achieve COD on March 7, he added. He said the LNG off-takers were either not ready or a few others had lower requirement for LNG while pipelines and storages were fully packed and hence the only option left was to reduce throughput from both terminals. The meeting was attended by Minister for Power Sardar Awais Ahmed Khan Leghari, Finance Adviser Miftah Ismail, Special Assistant to the PM Barrister Zafarullah Khan, federal secretaries senior officials of divisions concerned. The meeting was also “briefed on demand and supply situation and the power generation projections from March till October 2018”. Interestingly, the LNG supply jack up was particularly based on power plants’ requirement. The Central Power Purchase Agency (CPPA) and National Transmission & Despatch Company (NTDC) have been giving gas demand of up to 900mmcfd, but actual consumption in the sector has been less than 500mmcfd. For February, the power sector has been committing LNG offtake of 700mmcfd, but the supply remained less than 400mmcfd and some quantities were diverted to the domestic sector besides the industry. Under revised schedules, the Petroleum Ministry official said the two LNG projects of the federal government namely Haveli Bahadar Shah and Balloki and Qaid-i-Azam Power Plant (Bhikki plan) of Punjab government have confirmed combined cycle commissioning in early March (all three having 1,200MW). The three plants were to get firm supply of RLNG from December/January for combined cycle testing but they have so far failed to scale up supplies due to repeated technical failures. In fact, the three were to start single cycle operations over one year ago for which two LNG terminals were set up and LNG import arrangements were put in place at the expense of millions of dollars of the taxpayer money. The plants were to make ‘take or pay’ payments to LNG importers under back-to-back agreements in case of non-consumption of RLNG even in single cycle phase. However, the stakeholders in the supply chain have refrained from ‘take or pay’ settlement under orders of the PM Office to spread the losses across the chain instead of cost build up in LNG power plants to avoid Nandipur Power project-like cost escalations. The cost, therefore, shift to PSO, LNG companies and Sui gas companies besides the consumer at large. LNG terminal operators like Elengy and Gasport are qualified to claim full payments that increases the processing cost because of lower utilisation factor. Interestingly, chief executive of Qaid-i-Azam LNG project Ahad Cheema was picked up by National Accountability Bureau (NAB) in a different case when his first plant at Bhikki was in final stage of testing and he had been entrusted to undertake fourth LNG project of 1,200MW at Trimmu when it had become clear that enough generation capacity had been contracted. In the meanwhile, a number of low-cost generation project based on coal and hydropower have come on line like coal-based project at Sahiwal contributing 1,300MW, Port Qasim coal plant 600MW and expected to go up to 1,300MW soon. Additional nuclear power capacity of around 800MW is likely to be commissioned this summer while Tarbela-4th extension will give enhanced supplies in summer, followed by Neelum-Jehulm. The construction work on Tarbela 5th extension hydropower project on River Indus in Swabi district will start in 2018-19 fiscal year, Daily Times learnt on Monday. According to an official of the Water and Power Development Authority (WAPDA), the PC-I (planning commission I) of the project had been approved by the Executive Committee of the National Economic Council (ECNEC), in a meeting held in December 2016. Two loan agreements amounting to USD 390 and 300 million have been signed with World Bank and Asian Infrastructure Investment Bank (AIIB), respectively, for the purpose. After completing all formalities, World Bank and AIIB loans became effective from August 11, 2017, whereas the loan closing date for both loans would be June 30, 2022. The objective of the project is to facilitate a sustainable expansion of Pakistan’s electricity generation capacity without affecting the capacity for irrigation release. The total installed capacity of Tarbela Dam, after completion of the 5th Extension, will rise to 6,298 MW. The project would also benefit in further development of Pakistan’s hydropower potential along the Indus River Cascade which has been a cornerstone of the World Bank Strategy and Pakistan’s energy policy to reduce load-shedding, cost of electricity production, and improve financial sustainability. Regarding progress of the project, the WAPDA official said the process of procurement and recruitment for consultancy services was underway and a Request for Proposal (RFP) had been issued to shortlisted consultants. The official said technical evaluations of the proposals received so far were being done currently. Tarbela Dam was completed in 1974. It was designed to store water from Indus River for irrigation, flood control, and the generation of hydroelectric power. Almost 14 power generation units were installed at three tunnels during various stages with a cumulative installed capacity of 3,478MW, whereas the other two tunnels were for irrigation purposes only. The Tarbela 4th extension was made in October 2013 with a cost of $795.8 million and after the success of the project the 5th extension was planned which got approved by the Government of Pakistan. Water and Power Development Authority (Wapda) and the United States Agency for International Development (USAID) signed project implementation letter – 2 (PIL) worth $78 million for Mangla refurbishment project. The USAID grant will be spent for undertaking various works of Package V, VI, VIII and IX of the project. The PIL-1 of $72 million for Mangla refurbishment project had already been signed between USAID and Wapda in 2014. WAPDA Chairman Muzammil Hussain and USAID Mission Leader Jerry Bisson signed the letter. Due to the aging factor of the generating equipment and availability of additional water due to the raised Mangla Dam, Wapda is implementing Mangla refurbishment project with an approved PC-I cost of Rs52.224 billion. USAID is providing $150 million as grant and AFD, a french development agency, is providing €90 million as loan for the purpose, while rest of the amount is being arranged by Wapda through loans and from its own resources. Mangla Refurbishment Project, on its completion, will enhance generation capacity of the existing Mangla hydel power station from 1,000 megawatts (MW) to 1,310MW, thus registering an increase of 310MW. The refurbishment works have been divided into 11 different packages, which will be implemented in various phases. The generating units will be refurbished by closing down one tunnel (two generating units) at a time. Refurbishment of the first two units will be completed in year 2019, while refurbishment of all 10 generating units is likely to be accomplished by 2024. It may be mentioned that Wapda has been implementing a two-pronged strategy for optimal utilisation of hydropower resources. Under the strategy, Wapda has not only initiated new hydropower projects but has also been rehabilitating and upgrading its existing hydel power stations. Pakistan's Debt Crisis: Fact or Fiction?